Badfinger was a rock band formed in Swansea, Wales in the early 1960s that became one of the earliest prototypes of the post-'60s power pop genre. The band was at times tagged as the heir apparent to The Beatles, partly because of their close working relationship with them and partly because of their similar sound. 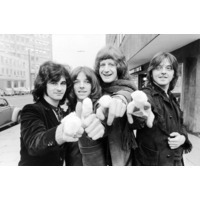 Badfinger had four consecutive worldwide hit songs in 1970-71, as well as recording the original version of "Without You," a frequently covered song that became a Billboard #1 hit for Harry Nilsson and a #3 hit for Mariah Carey. After their initial hit song on The Beatles' record label, Apple – "Come and Get It" (which was written by Paul McCartney) – the band members entrusted their financial affairs to an American businessman Stan Polley. Internal squabbling, artistic differences, and allegations of financial mismanagement eventually led to a freeze on the band's activities and income. Founding member Pete Ham committed suicide on April 24, 1975, leaving a damning note about Stan Polley. The band folded following Ham's death, and various subsequent attempts to reform Badfinger floundered. Band member Tom Evans, who saw Pete Ham's body hanging, also died by suicide, on November 19, 1983. Evans never got over his friend's suicide, and has been quoted by many as saying in darker moments, "I wanna be where he is." The band's story was once described as "the classic rags-to-riches story with a tragic Shakespearean ending."